Galería de Arte de Oaxaca, Oaxaca. Anon. sale, Christie's, New York, 20 - 21 November 2002, lot 131 (illustrated in color). The painter Rodolfo Morales once said, "I have three pleasures in life: painting, selling, and then, in turn, sharing what I receive with everyone." Born in 1928 in the little town of Ocotlán where life revolved around the town plaza--the artist's generosity was renowned. With us, he shares his boundless love for the landscape and traditions of his native Ocotlán--a place that inspired him and is the setting for his incandescent narratives. It is a landscape of dazzling colors and legends from ancient times; the home of wondrous flowers and sensual women; a mythic paradise that defies beauty itself. The artist situated his works in his native soil as if possessed by it and its magical essence. Morales studied to become an art teacher in Mexico City's Escuela Nacional de Artes Plásticas de San Carlos and became a drawing instructor at the Escuela Nacional Preparatoria in the 1950s. The artist traveled to Europe and throughout South America during the late 1960s and early 1970s. 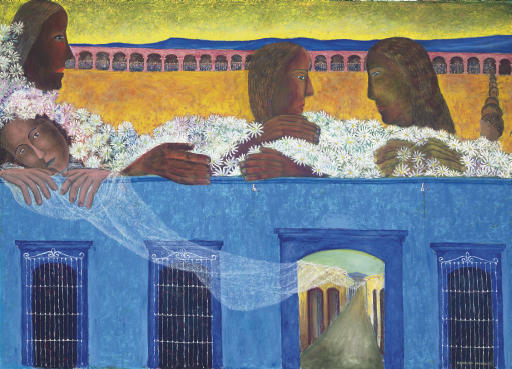 In 1975, Morales received encouragement from Rufino Tamayo and embarked on his most noted works such as this one. The artist returned to his hometown after the devastation of the 1985 earthquake in Mexico City and spent the rest of his days painting but also gifting his town with his generous spirit; he rebuilt churches; funded art centers and donated his time and moneys to benefit his community. In his paintings, Morales spins wondrous tales about women--in love, in pain, at home, with their children or friends, sharing secrets in the town market, at church--in vignettes and scenarios that seem animated by the artist's exuberant palette. He knew his characters, and their lives--their joys and sorrows; sometimes, they transcend their mere existence and become ethereal--not ghosts but somehow, lighter than life. His compositions are visual tapestries that relish the sheer joy of everyday life and all its imperfections.